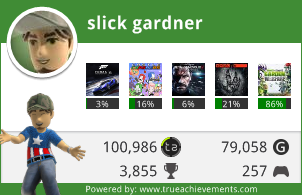 Home › General › My XBOX360 is cooler than your XBOX360! My XBOX360 is cooler than your XBOX360! 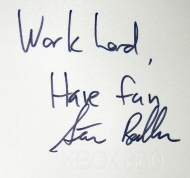 Because my XBOX 360 is autographed by Steve Balmer! So there! 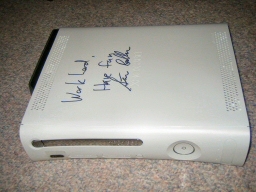 I won this autographed XBOX360 at a charity auction for Clyde Hill Elementary school in Bellevue, WA. It is the pro version, with an extra wireless controller and the media remote, and PGR3 and Kameo. HD Gaming here I come! Reviews of the 360, Project Gotham Racing 3, Kameo, and the new Ghost Recon game after the jump. 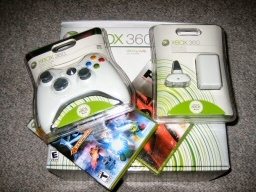 I won the 360 for a very reasonable price for the bundle. I expected to have to fight off some rich kid’s parents, but people stopped bidding real fast. I was pretty suprised, but i figured the rich kids already have their 360’s. I know a lot of MSFT children go to this school, so they might have even gotten them early, so they didn’t need this one. Since it was to a charity auction to the school, part of the cost is tax deductible, so got an X360 before they are easily available and its a tax write-off! 🙂 nice! The bundle that i won came with the xbox full version (not the core version), so i got the hard drive, a wireless controller, and a mini media remote thing. The bundle also included another wireless controller with the plug and charge kit (or whatever it is called). The charge kit contains a rechargeable battery pack and a wired connection, so you can play wired while the controller charges. I wasn’t sure i was going to like the wireless controllers. I figured they’d be cutting in and out, or missing button presses or would be dead in an hour. Nope! They have both worked awesome and so has the media remote. I still flinch when someone walks between me and the TV, just waiting for the controller to rip out of my hand as they trip over the cord. I’ve gotten used to being able to lounge comfortably on the couch because i’m not stuck so close to the giant tv, so this wireless controller really has me hooked so far. Its great to be able to use the media one to turn the 360 off without getting up, too. Lazy! I already had the original xbox wireless g adapter, so getting into xbox live was trivial. unplugged the network connection from the xbox, and plugged it into the 360. done. connected up like a charm, then the 360 downloaded some updates and it was all ready to go! The bundle also came with 2 games: Project Gotham Racing 3, and Kameo: Elements of Power. PGR3 is just awesome. I’ve always “liked” racing games, but i’ve never been great at them. The cars in PGR3 sound great, look great and drive great. I’ve even gotten laura to play some! She’s never been a big gamer, so its taking her some time to get used to the controller, but she also has great taste in cars. She sure likes the Lambo’s! Kameo had me confused in like 5 minutes of playing. I got to one part in the beginning (before i figured out about the hints thing), and i was just stuck. It was one of those things where i was sure that if i was 10 years old, i’d have already figured it out. Well, i’m 3 times that old, so it took me 3 times as long to figure out what to do. I even gave up for a day and played PGR3 instead. Came back the next day and in 2 minutes figured out that the plant guy could do an uppercut and knock a shell off the ground where the dude was hiding. Grrrrrrr! After that, the story gets a lot more interesting. And then i got the new Ghost Recon: Advanced Warfighter. GRAW has been pretty awesome! I’ve never played any of the other ones in the series, so i didn’t know what to expect. The graphics are great, the effects are great, the sound is great. The transitions between “cutscenes” and gameplay is nice. Its all in engine, where you might be in a helo or tank, but you can still look around. You can see the pilots talking and flying, see mexico city, and watch a sunset all while listening to the story continue over comms. The AI enemies seem to be a bit smarter than the AI friendlies though. it seems that the enemies will hide behind cover and fire, but if the friendlies are told to attack a target, they’ll move from behind their cover into the open instead of shooting over/around their cover. Some sections i need to just have them hold somewhere while i pick people off one by one. My biggest peeve is that if a teammate is incapacitated right next to them, they just stand there like a dufus and watch him die. Sure, you can tell him to give first aid and he’ll do it, but come on, you saw your buddy get shot! Hide and fix him already! I haven’t played any online GRAW yet though. I tried out some deathmatch quake 4 demo, but wasn’t super impressed. Its kinda hard to get into it when some 10yo kid who knows the map is rocking you all day long, and taunting you the whole time over the headset. Ugh. I did download some demo videos, a demo of Joust and some other crap. Its all a pretty slick setup, aside from the fact that you can’t do anything else while downloading. I’ve heard that’s getting changed in a future update, so it isn’t a big deal to me. I also hooked up the windows media connect stuff so that i can stream music of my computer. I used to have the TiVo downstairs with that setup, but now that we have the HD comcast DVR, the TiVo is in my office, so the 360 can perform the music duties. The visualizations are nice, although they all seem too fast for me. I feel like i need to be on X or some other drug to appreciate the crazy pictures. It would be nice to have title, artist, other ID3 info fade in/out when songs change, though. Now we just need to get another HDTV so that i can play games AND watch tv at the same time! ‹ My XFire “Gamercard” hack.